FELLOW-CITIZENS: I will have to ask your silence in order that my voice may reach to the farthest circumference of this vast throng. I am glad to see you here in your strength. The people are the Government, men in power only their servants. That is what is meant by Republicanism. There are two sets of principles, one represented by Gen. Gresham, in this District, and the other by Michael C. Kerr. The former represents live principles, progressive ideas and loyal proclivities: the latter the worn-out, defunct, rotten, disloyal Democracy. To-day I propose to refer to Mr. Kerr's record in connection with the Sons of Liberty; other questions have been thoroughly discussed, you understand them. The only real one, after all, is whether rebels or loyal men shall rule this nation. Kerr has been invited to be present. I came here to meet him. I desire to meet him. I wish he were here now to hear what I have to say. I sent for him once when I had a few blue-coats at my command, and he came. He was loath to come then, and he is loath to come to-day. I cannot now force him to the trial before you, but you can give your verdict and will settle the matter, unless these disloyal men, whom Kerr represents, again light the torch of war. Then they will be annihilated. In 1861 I was one of the soldiers of this land, marching with my knapsack upon my back to meet with my companions my country's enemies. After two and a-half years of service I was called by the great Lincoln to perform the duties of Judge Advocate in the army. My business was to examine records, give legal opinions, and form Military Courts. My department in the East was Kentucky, East Tenesee and the Army of the Ohio -- in the West, Illinois, Indiana and Michigan. There came into my office, in Cincinnati, affidavits setting forth that a vast conspiracy existed in the Northwest, having for its purpose the severing of these States from the East and forming a separate government; and, failing in that, to join forces with the South and assist it to achieve independence. I could not believe that such a thing could be -- it was too horrible, too contrary to my notion of the patriotism of the people. Yet prudence demanded that I should probe the matter to the bottom. I did so -- calling scores of witnesses until the monstrous plans and purposes of the conspirators could no longer be disbelieved [fold obscures text] and more than was charged appeared. I then came to Indiana a perfect stranger - knowing nobody -- and not caring for the politics [fold obscures text] implicated by the affidavits referred to. Nor, fellow-citizens, did I know anything of them when I had them arrested, except by name. I put Dodd, Bowles, Milligan, Humphreys and Horsy upon trial. When Dodd first confronted me he was brazen and defiant, declaring that no such Order existed as the Sons of Liberty; that there was an organization for the purpose of egetting Democrats out to the polls, but when he saw Stidger, a shrewd Government detective, who had worked into his confidence, and the confidence of the Order until he had been Secretary of it in Kentucky, he dropped his jaw and from that time on he never looked up. He knew then that he was caught and that the Government he had tried to destroy was in full possession of all the proof of his damning crime. From that time forward he thought of nothing but escape -- and escape he did. Other witnesses were put upon the stand, and the Democratic party was deeply involved in the treasonable schemes of the order. At this point J. J. Bingham, editor, of the State Sentinel newspaper, and Chairman of the Democratic State Central Committee, began to denounce the whole proceedings as an abolition electioneering performance. Having, however, the rolls of the order -- on which was Bingham's name -- I concluded to send for him in a way he could not refuse to obey. He came, and trembled like Belshazzar at the thought of the consequences which would follow his connection with the order. He begged to be spared, and said he would tell all and save the country from the horrors of the impending doom. But I promised him nothing. I had no right to. I only told him he must take his chances with a great and magnanimous Government. He did, and was not prosecuted, but put upon the stand as a witness. He disclosed more than Stidger knew. He who said it was all a lie, seeing that the Government knew enough to convict him, told all. Now who was and is this Bingham? A Democrat then and a Democrat now. His testimony stands unimpeached, and is unimpeachable. Bingham was to call a great Democratic meeting at Indianapolis, and the thousands who were to attend it were to come with arms in their wagons covered over with straw. At certain signals they were to rush on the soldiers in the city and capture them. They were then to let loose the 7,000 Confederate soldiers at Camp Morton, destroy Indianapolis, come down the Jeffersonville road, rendezvous at New Albany, destroy it and Jeffersonville, cross over to Louisville and destroy it, and unite with the rebel forces coming in through Cumberland Gap. The Missouri Sons of Liberty were to capture St. Louis, join with Price, and all the forces uniting, 200,000 strong, with 50,000 released rebels, were to march to Sherman's rear, crush him between themselves and Johnson, and dictate terms to the United States. Their scheme failed. And why? It failed because the Government was fortunate enough to find it out through the faithfulness of its own officers. No Democrat revealed any thing of it until it was with a view of escaping himself from the consequences of his crime. I do not say that the eighty thousand in Indiana who had been sworn into the Sons of Liberty, knew at first of its full purpose, but they were bound in such a manner to their chiefs, by such solemn and fearful oaths, and were so sedulously educated to hate the Government, and so thoroughly imbued with the false belief that in undertaking to coerce rebls, it was assailing the principles of our Government, that they would have seized, without any question, the arms which were deposited at convenient places, at the word of command, and marched against the Union army. The doctrine of State sovereignty, which placed the State above the General Government, to which they swore support; the belief they held that the principle of the rebellion was correct and ought to be sustained; the oath that bound them to obey their leaders and not reveal the secrets of the order, and the complete frenzy to which they had been cunningly and wickedly wrought by the false representations of the Government's intentions, conspired to render it certain that we were on the eve of the most horrible scenes of blood and rapine which history has recorded, when the Providence of God, who has watched over this nation from the beginning, enabled the Government to circumvent this awful scheme and prevent its consummation. Involved in this conspiracy was your man, M.C. Kerr, and I have no hesitation in pronouncing him a traitor [fold obscures text] commit the "over act." In intent, in spirit, in purpose, he was a traitor. I say this, fellow citizens, dispassionately, and am responsible for what I say here or elsewhere. I KNOW MICHAEL C. KERR WAS A MEMBER OF THE ORDER, FOR HE CONFESSED IT TO ME HIMSELF TIME AND AGAIN when I had him in Indianapolis, trembling for his miserable life. I wish he were here now, that I might tell him to his teeth that he admitted to me -- and never thought of denying it -- making it the basis of all our conversation, that he was a Son of Liberty. I believe if the mass of Democracy were here to-day, they would leave him and give their support to that gallant soldier, General Gresham, who, drawing his sword and flinging the scabbard to the rear, never turned his back upon the enemy until they lowered their standard in utter defeat. They could not retain their manhood and vote for such cowards as Kerr, who stayed at home and found fault with the army's fighting. I propse to examine the evidences of Kerr's being a Son of Liberty outside of the admission he made to me. Heffron was the person and political friend of Kerr -- Kerr was not upon trial -- and was only mentioned incidentally on the trial of another man. What was the motive for him to testify falsely? Men always have some motive. The writers upon the human mind and will all agree that no man acts motiveless. I challenge Kerr to show one single motive Heffren could have for involving him -- He must have sworn truthfully -- he could not have sworn otherwise. I took him, gentlemen, for a witness, because of all the prisoners there he had shown himself the bravest -- had said the least to me about release. I believed he would tell the truth, as he was not such a cringing, craven wretch as his fellow prisoners were. What motive, too, had Bingham for mentioning Kerr. He was a brother Democrat, he had been his friend. Kerr was not charged with anything. Yet he speaks of him as a member of the Order. Let us look at this matter for a moment. Kerr not a member of the Order. How then did he know its secrets? One Ghormley says he told him. If he did then Ghormley was a member himself. This whole thing is summed up in this. The violation of the oath of secrecy was a shameful death. No less than being quartered and "thrown out of the four gates of the temple." Nothing but the utmost secresy could insure its success. Yet Kerr has the effrontery to tell us that he knew about these things and yet was not a member! Gentleman it is preposteous. It don't hang together. It is all the most absurd nonsense, and nobody believes it. On the 3d of August, 1864, Kerr went to Indianapolis and met Bingham on the street, and told Bingham all about the scheme, just as Dodd had the day before related it to him (Bingham.) His first answer to his saluation, "Halloa, Kerr, what brought you here." was, excitedly, "Do you know anything?" Kerr said all this, and much more. Now, does any candid man suppose he could have gone from New Albany to Indianapolis with such details in his possession and not have received it from a member of the Order, and because he was a member himself? Why did he [fold obscures few characters] Had Kerr's subsequent course been such as to confirm the good opinion I formed of him when I met him in Indianapolis, I should not have been here to-day. I looked upon him as of the great mass of the 80,000 deluded men in the State, and regarded his willingness to expose and stop the proposed uprising, as either the repugnance of a good man to such a nefarious business, or the timidity of a man of small courage and caliber. He was not on trial, and I did not propose to put him upon trial, although he was very much frightened lest I would, and hence I did not look very carefully into the motives which led him to attempt the stopping of the mad programme. I now see it plainly. When I heard that he was denying that he had ever been a Son of Liberty. I was astounded, tried to bring him distinctly to mind and did so. I then resolved to come at once into the Second District, and confront him to his face [fold obscures text] statement that I KNEW HE HAD BEEN A SON OF LIBERTY. I have been here nearly all the week, and have publicly, in every way, invited him [fold obscures text] insuring him a fair hearing -- but he has not done it. If he or any of his friends are in this crowd, let him or them come upon this stand and I will give him a fair chance. Michael C. Kerr knows that he was a Son of Liberty and dare not deny it to my face. I challenge him to deny that he repeatedly in various ways admitted it to be a fact. The true reason for his exposition of the schemes of the Order now appear. In the light of all this base denial it becomes luminous. The arrest of Judge Bullitt, and the flight of members in Kentucky to Canada -- revealted to him that the authorities knew all about the matter. This shows when we come to examine it, that he went to Indianapolis to save his friends and his own cowardly hide and neck. He knew pretty well that the Government authorities were prepared, and probably had the names of the conspirators, and any violence they might commit would only bring them and him as one of them into trouble. Had this not been the case why did he not go to the United States authorities at once with his information. No gentlemen, he was willing, and this was enough to damn him, to help those men escape. He who knows of a murder about to be committed and does not report it to the proper authorities is guilty of murder himself. Were Bingham and Dodd the proper authorities to report such a terrible scheme to? I didn't look thus deeply into Kerr's connection with the matter at the time of the trial, for I had no particular reason for pushing my mind out after all [fold obscures text] conclusions to which I might have come in regard to the hundreds of insignificant men, like Kerr, who were before me. All that the Ledger of this city, has said of my remarks on the trial of the conspirators is correct. But it does not follow that I think so now. I have since learned that Kerr was a leading politician, and have gotten an insight into his false-heartedness through his extraordinary denial of his connection with the Sons of Liberty at all. From this denial alone, which stamps him as a LIAR, I infer that his connection with the order was not innocent but criminal. Nothing which has been quoted goes to show that I ever, for one moment, doubted that he was a Son of Liberty. That I never doubt, and that I do not doubt it now. How cowardly it was in Kerr, Dodd and the other Democrats, who were Sons of Liberty, to desert and sacrifice poor Bingham and Heffren! But those who could stab the Government which had protected them in its prosperity could not be expected to stand by their friends in adversity. In regard to my former opinion of Kerr I may say that I once thought Andrew Johnson true -- fiathful among the faithless, but now I know him to be faithless among the faithful. The principle point in Gen. Burnett's argument in regard to Kerr was that he now meanly denied having been a Son of Liberty, and the meaness and contemptibleness of his deniial showed him to be mean enough to have been the very meanest kind of Son of Liberty. Gen. Burnett bears the marks of nobility upon his face. He is above reproach -- too brave to falsify, and too noble to do a man injustice. HE CALLED UPON GOD TO WITNESS THE TRUTHFULNESS OF HIS STATEMENT THAT KERR HAD TOLD HIM THAT HE BELONGED TO THE ORDER. After having convinced every one, who listened to him without prejudice, that Kerr was a Son of Liberty, he again referred to the treasonableness of the order. He swelt upon the facts that there were couriers running regularly between the members of the order in the North and those in the South, that Barrett, a Confederate officer, had at Chicago $2,000,000 of money, captured from a Federal paymaster, which was authorized to be placed in the hands of the Sons of Liberty, for the purpose of paying a part of the expenses of the new government; that Confederate officers met in Indianapolis, and that ten men had been assassinate Governor Morton. He drew a vivid picture of the devastation, rapine and murder, which would have followed the turning loose upon the State the pack of "Confederate hell-hounds" confied at Camp Morton. Democratic houses had been signalled so as to escape by placing in some of them a Star, and in some, portraits of John Morgan. And we may add ourselves that nothing in the history of the world is more revolting and devilish than this cold-blooded plan of home traitors, to have our families slain, and many of them worse [fold obscures text] hating, revengeful rebels whom they proposed to let loose. I desire to impress you more fully, if I can, with the fact that Kerr must have been a Son of Liberty to have known what he did. In all the conspiracy trials in which I was Judge Advocate, including the trial of the assassins of Mr. Lincoln, I examined and conversed with not less than fifteen hundred persons who had been connected with secret orders, and never did I learn any of their secrets except from members. No outsider ever did or ever could give me information. Yet Kerr, more remarkable than all other men, had found out the greatest and most important secret that ought to be kept, and that, too, in all its details! Fellow-citizens, I know you are not so simple as to believe any such stuff. Kerr must have been a member. He was a member. If he was not, let him come here and tell me, if he dare, that he did not ADMIT IT TO ME. What sort of a man is he to beat General Gresham with, a man and a General without reproach, without a stain upon his veracity, but on the other hand, covered all over with glory, bearing a wound upon his person. For shame! For shame! you stay-at-home Democrats, for not recognizing your defender, and assisting in crowning him with honors. "Whenever the officials, to whom the people have entrusted the powers of the Government, shall refuse to administer it in strict accordance with its Constitution, and shall assume and exercise power and authority not delegated, it is the inherent right and imperative duty of the people to resist such officials; and, if need be, expel them by force of arms. Such resistance is not revolution." "Many as the billows, one as the sea," ripples upon the surce, all unity and calm below. Now who will vote for Kerr, who swore to subvert this doctrine? [Nobody]. Johnson has kept one pledge, that is to make treason odious. In his own person it is more odious than ever it was before. He has betrayed everbody, even the negroes, and nobody believes him. I hope he wont come back to us. We've had enough of him. Bury, my countrymen, with your white ballots written all over with the purity of loyalty -- like snow-flakes falling upon the ground the loathsome treason which you began kill out in 1860, and gave heavy blows to in 1865. Send the glorious Gresham to Congress from this district and keep all peace sneaks at home or where they can do no harm. Keep the old crew on board the Ship of State and it will land us all safely in on the shore of peace, prosperity and liberty. I take you for your profound attention. [Tremendous cheers]. CORRESPONDENCE WITH JUDGE ADVOCATE H. L. BURNETT. Commerical Office, New Albany, October 2, 1866. DEAR SIR: Your position as Judge Advocate during the celebrated treason trials at Indianapolis in 1864 gave you peculiar means for ascertaining the objects, membership and workings of the Order generally known as the Sons of Liberty. Will you do me the favor to state if Michael C. Kerr was a member of that Order, and whatever else you iknow with reference to his connection with it? For such information, in as much detail as possible, I and the loyal men of this District will be under great obligations. We want simply the facts. Louisville Hotel, Oct. 2, 1866. 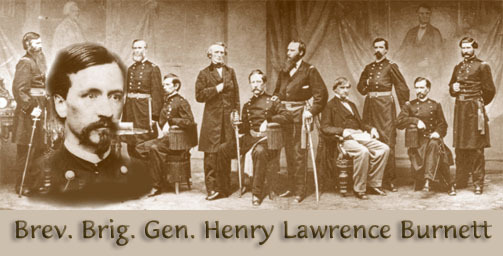 SIR: To your communication of this day I reply: While the Treason Trials were progressing at Indianapolis, in the fall of 1864, I sent for Mr. Kerr, as I did for many members of the order, with the object of either putting him on trial or using him as a witness, and also for the purpose of questioning him as to the purposes and objects of the order of the sons of Liberty, of which the rolls, captured at Dodd's office and the residence of other witnesses, had shown that he was a member. In that interview he unhesitatingly admitted that he was a member of the order. I saw him several times after and conversed with him upon the subject of his membership. He never hesitated or equivocated upon the subject, but always frankly admitted that he was advised in an interview with Dodd and others, of the contemplated uprising of the 17th of September, 1864, and was willing, as he stated to me, if put upon the stand, to testify to those facts. The ultimate purpose of the Order, in my judgment and that of all the officers engaged in the investigation, was as treasonable and more damnable than the rebellion itself. Late Judge Advocate, U. S. V.